Canoeing at Plas Menai National Outdoor Centre CanoeingNorth Wales boasts some of the best paddling waters in the UK. The surf beaches, sea cliffs, tide races and offshore islands of Anglesey and the Llyn Peninsula, and the white water rivers and lakes of Snowdonia are all easily accessible from the Centre. 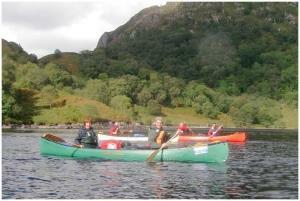 Plas Menai offers a range of canoe and kayak courses for all levels of ability. Our 5 day Learn to Kayak is a perfect introduction to all aspects of this dynamic sport including open boat canoes, closed cockpit and sea kayaks. The Centre is open all year around however it does close between Christmas and New Year..